Stefanos Tsitsipas is set to be slugged with a huge fine. A LESSON in geography would not go astray for Stefanos Tsitsipas after the Greek sensation blasted a linesman on Friday with a string of expletives in his native tongue. Melbourne is said to host the third largest population of Greeks outside the country itself. So it stands to reason Tsitsipas' outburst, loosely translated below, was understood by more people than the Greek star bargained for. "That w------ there has f----- me. F--- your house," Tsitsipas shouted after dropping serve at 5-3 in the third set following a reprimand for a second code violation. Not surprisingly the outburst resulted in another reprimand and by the end of Friday, Tsitsipas can expect a big fine. He managed to recover from the mid-match meltdown to triumph 6-3 3-6 7-6 (9-7) 6-4 over Georgia's Nikoloz Basilashvili in two hours and 54 minutes at Margaret Court Arena. Tsitsipas settled down after the expletive outburst, going on to win the third set in a tiebreak. "I am delighted it was a tough match today - conditions were different than the other days," Tsitsipas said after the match. "I feel so comfortable here, I feel like I am playing at home. It's exciting to have such an atmosphere when I am on the court." 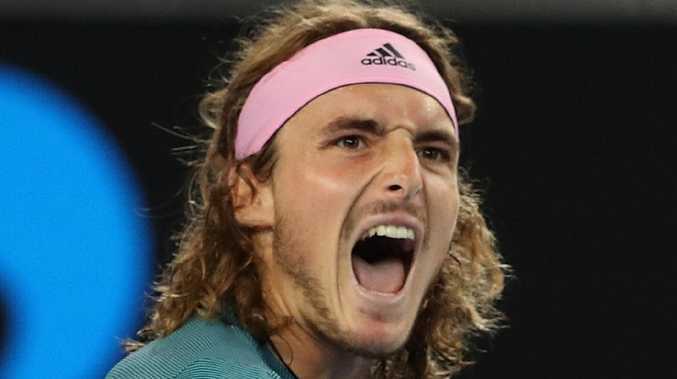 Tsitsipas is the first Greek man to reach the round of 16 at two tennis majors. He will next face defending champion Roger Federer, a 6-2 7-5 6-2 winner over American Taylor Fritz on Sunday. "It's going to be an amazing thing playing at Rod Laver Arena," Tsitsipas said.